This time last year, Gardner Minshew wasn't even on a Pac-12 roster. But he ended the season as the conference's top Heisman contender. Will the same hold true in 2019? 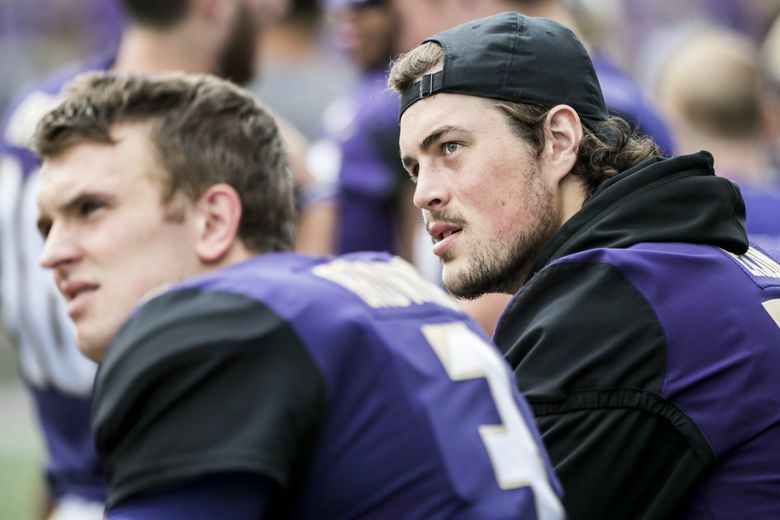 Does UW's Jacob Eason have a chance? At the time, Gardner Minshew wasn’t even on a Pac-12 roster. The most predictable aspect of his emergence on the Heisman scene was its unpredictability. The 2015 season was supposed to be about Jared Goff as the Pac-12’s top candidate, but it tilted to a first-time starter named Christian McCaffrey. The 2016 season was supposed to be about McCaffrey but flipped to Jake Browning. The 2017 season was supposed to be about Sam Darnold and Josh Rosen but turned into the Bryce Love show. And the 2018 season was supposed to be about Love and Arizona’s Khalil Tate before Mr. Mustache came from the far reaches of nowhere — Washington State via East Carolina via Northwest Mississippi — to finish fifth. Who is the Pac-12 favorite for 2019? With apologies to Herbert and Costello … sorry, Abbott and Costello … that’s exactly right: Who is the favorite in 2019. Also considered: Oregon State running back Jermar Jefferson, Utah quarterback Tyler Huntley, Colorado quarterback Steven Montez, UCLA quarterback Dorian Thompson-Robinson, Arizona tailback J.J. Taylor and Washington receiver Aaron Fuller. 10. UCLA tailback Joshua Kelley: Averaged 135 yards per game once he became the Bruins’ first option in late September. If Kelley were to add just 10 or 15 ypg to that total and keep the pace for all 12 games, then he’s in 1,800-yard territory. 8. Washington quarterback Jacob Eason: The Georgia transfer has the arm talent to elevate UW’s aerial game, and he’ll have the name recognition with Heisman voters in the southeastern quadrant. The line should be solid, and the receivers are talented. Sleeper candidate No. 1. 7. Arizona State tailback Eno Benjamin: After a 1,600-yard season, Benjamin is actually on Bovada’s early Heisman board (albeit far down the list). We’re impressed by his talent but skeptical of his chances: The departures of N’Keal Harry and Manny Wilkins will likely result in opponents keying on Benjamin and forcing ASU to throw. 6. Arizona quarterback Khalil Tate: Lowered expectations will help. So will a healthy ankle. So will a (presumed) better use of Tate’s skills on the part of Kevin Sumlin and offensive coordinator Noel Mazzone. But the Wildcats have to win at a high level for Tate to make a run for New York, and that’s hardly a given. 5. Stanford quarterback K.J. Costello: His statistical trajectory indicates a serious Heisman run is possible (29 TDs, 65 percent completions in his first year as a full-time starter), but most of Stanford’s playmakers are gone, including Bryce Love and JJ Arcega-Whiteside. And the schedule is brutal. 4. Colorado receiver Laviska Shenault: Was on the Heisman radar in 2018 before a toe injury derailed his season. Shenault’s versatility creates the potential for enough touchdowns and highlights to grab the electorate’s attention, but playing 1-on-11 for a full season isn’t easy. He’ll need help. 3. Utah tailback Zack Moss: Our second sleeper. Moss laid the statistical groundwork last season (134 ypg once Utah upped his workload to the proper level); the Utes are committed to the run but have the aerial balance to create lanes for Moss; and they should win enough games — the division and perhaps even the conference — to attract eyeballs. The Moss bandwagon is empty, so hop aboard. The Hotline’s driving. 2. Oregon quarterback Justin Herbert: From the experience to the arm talent to the NFL draft hype to the offensive line (five returning starters) to the name recognition, Herbert has the key pieces in place — well, most of them. He needs help from an unproven group of receivers and more creativity in the play calling. 1. Who. We’ve covered the established contenders and the sleepers, but recent history suggests an unknown-unknown, so to speak, has the best chance to reach New York. That player could be a yet-to-arrive graduate transfer, a redshirt freshman or a second-tier contributor in 2018 who makes a giant leap.